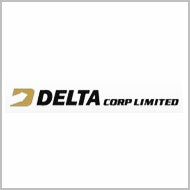 Technical analyst Anil Singhvi has maintained 'buy' rating on Delta Corp Ltd stock with an intra-day target of Rs 120. According to analyst, the investors can hold the stock with a stop loss of Rs 108. The stock of the company, on November 30, closed at Rs 111.05 on the Bombay Stock Exchange (BSE). In standalone net profit for the three month period ended September 2010, Delta Corp recorded 28.81 times growth to Rs 1,263.70 million as against Rs 43.87 million during the corresponding quarter of 2009. Company's net sales for the three month period surged 17.77 times to Rs 2,521.40 million. The total income of the company for the said quarter jumped 17.60 times to Rs 2,527.90 million as against the prior year period. The company recorded earnings of Rs 7.56 per share in the quarter, recording 23.62 times growth over earlier year period. Delta Corp, in September 2010, announced that it has accomplished the sale and purchase deal of acquirement of equity shares of Advani Pleasure Cruise Company (P) from Advani Hotels and Resorts (India) (AHRILL).